Visiting London is an incredible experience, no matter where you go, where you’re staying, what you eat and what sights you see. However, there are places in London that can enrich your experience as a tourist, whether it is accommodation, dining, or proximity to the most interesting attractions. This carefully curated list indicates the best places to stay and visit in London if you want to benefit from the easiest trip, the highest standards and the best quality services available, suitable for all tastes, interests and budgets. Westminster is one of the best areas in London; jam-packed with historical buildings and tourist attractions, it’s a veritable Mecca for tourists. The impressive Buckingham Palace, the Houses of Parliament, the world-famous Westminster Abbey, quintessential British landmark Big Ben, the Royal Academy, the National Gallery, Tate Britain, the Cabinet War Rooms and the National Portrait Gallery are all at your fingertips in the centre of tourist life in London. Shopping is an experience you can engage in anywhere, but not like in Westminster. Here, you can visit the world-renowned Selfridges, Fortnum & Mason and Topshop, as well as many other exclusive boutiques. Eating is a special experience in this area, as well; for traditional British dishes, look no further than Petrichor, but if you want something more modern – or even futuristic – your best bet is Inamo St James. Due to its prime location, at the centre of all the action, Westminster is a very sought-after place to stay. Look at luxury hotels like The Goring or the Royal Horseguards, but lower-end options are also available, such as the YHA London Central. The area is served by several buses, as well as Tube lines. St James’s Park Tube station is on the District line and Circle line, while Westminster Tube station is on the same District and Circle lines, with the addition of the Jubilee line. Camden Town is the ideal area for you, if you’re a lover of shopping, good music and going out at night. Camden High Street and Stables market will prove to be destinations that cannot be missed for browsing the latest styles, as well as a quality vintage selection. Pubs and nightclubs are also easy to locate and there are plenty to choose from, depending on your preferences for live music. From folk, to jazz to metal, there is something for everyone in Camden Town. Bus or tube are the most efficient means of transportation and the latter can be accessed through Chalk Farm Tube station or Camden Town Tube station. Dating back to the year 50 AD, the City of London can be found at the very centre of London and can be reached easily through Liverpool Street station, which also allows for simple transportation to other destinations in the UK. Trains, buses, taxis or the Tube can all be accessed at Liverpool Street and are efficient means of transportation other parts of London. The City of London is not only the business centre of the city, but also a great location for architecture, both modern and historical. 17th century churches, 18th and 19th century financial institutions, as well as newer buildings, like “The Cheesegrater” and “The Walkie-Talkie” buildings can be admired in this area. In addition, some of London’s most famous attractions can be found here: The Tower of London, Museum of London, Tower Bridge, Guildhall Art Gallery, Bishopsgate Institute, The Monument, Royal Exchange, St Paul’s Cathedral, the Barbican Centre, the Bank of England Museum, the Mansion House and plenty more. Impressive architecture can be admired in the South Bank area of London, including Queen Elizabeth Hall, Hayward Gallery, the Royal Festival Hall and the Purcell Room, all within the South Bank Centre. The art and entertainment scene here is generous and worth checking out by aficionados. 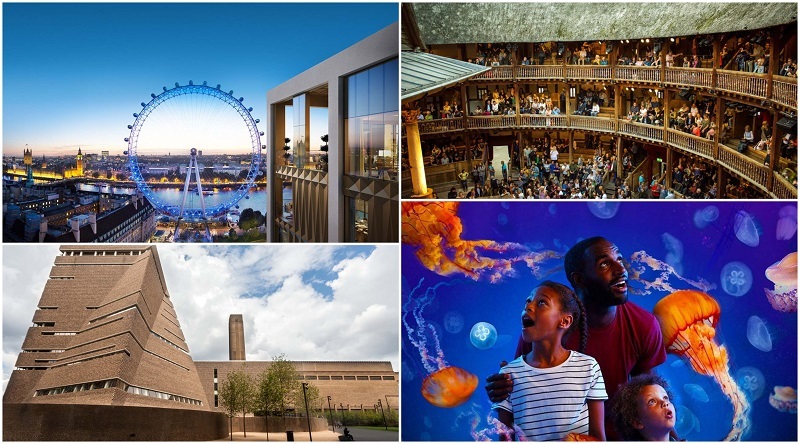 Tate Modern, Shakespeare’s Globe Theatre, The London Dungeon, The National Theatre, the London Eye and the SEA LIFE London Aquarium are only a few of the attractions that can be visited in this area. London Waterloo is accessible by train from the South East of England, through the London Waterloo station. Southwark, Blackfriars and Waterloo stations make the area easily reached by bus or tube, the latter station being served by the Bakerloo, Northern and Jubilee lines. British pubs, Asian cuisine and open-air dining are all available, as well as a good range of hotels, in case you find yourself staying overnight. One of the trendiest areas in London, without a doubt, is Soho. Everything worth noting is happening here, whether we’re talking about dining, theatre, shopping, entertainment or nightlife. It is an open-minded, non-judgemental zone which welcomes everyone. This is why the area is popular among the gay community and home of the burlesque scene. A wide range of restaurants is available in Soho, to suit every taste and craving. From sushi at Cape Town Fish Market, to snacks at Yalla Yalla, Indian food at Masala Zone, Imli Street or Cinnamon Soho, or to brunch at the appropriately-named The Breakfast Club Soho. Fine cuisine and modern dining can also be experienced here, in places such as Social eating House, Gautier Soho, Blanchette or Polpo. Travelling in and out of Soho is simple by bus or tube. Stations include Oxford Circus, Leicester Square, Piccadilly Circus and Tottenham Court Road. 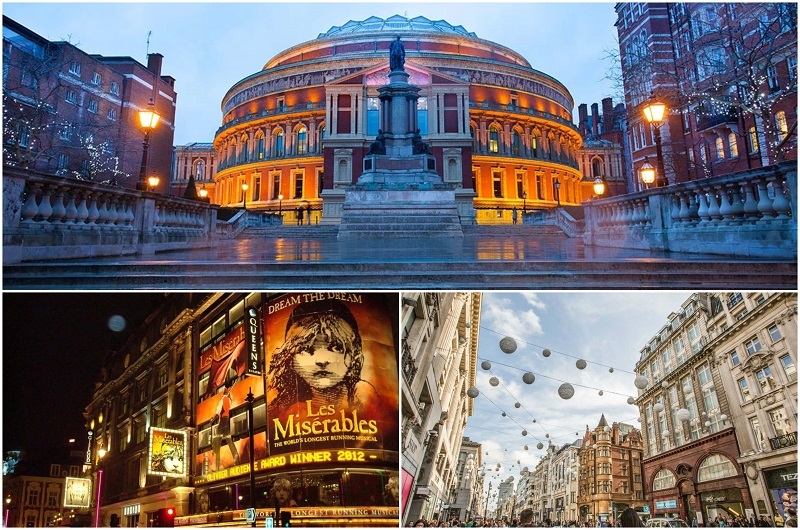 The West End has it all, when it comes to pleasing tourists: great entertainment, plenty of tourist attractions and shopping. The National Portrait Gallery, the London Transport Museum, Piccadilly Circus, Oxford Circus, Leicester Square, The National Gallery and The Royal Academy of Arts can all be found here. In addition, the West End features some of London’s highest-quality shopping streets, including Bond Street, Regent Street and Oxford Street, where you can find famous department stores, such as Liberty, but also flagship stores from the likes of Selfridges, Topshop, Apple and Ralph Lauren. No guide to the West End is complete without mentioning its important theatre scene, rivalling Broadway. Because West End is an extensive area, tube, bus or taxi travel are all valid options. The busiest underground stations are Piccadilly Circus, Oxford Circus, Leicester Square and Covent Garden. 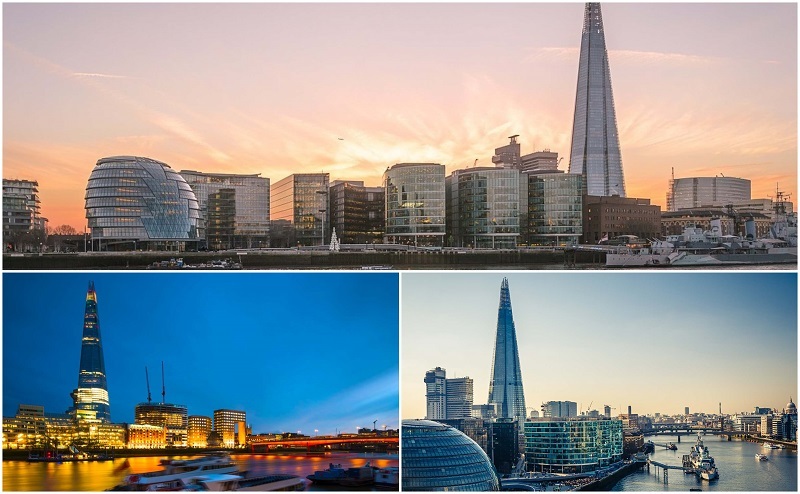 The London Bridge area offers the experience of travelling down the river by boat, either a City Cruise or a Thames Clipper from the Tower Bridge pier and the London Bridge pier respectively. The area is optimal for tourists spending a few days in London, because of the large selection of attractions, as well as bars, hotels and restaurants. The London Bridge area is very well linked through public transport, not only through the overland rail network (Charing Cross, Cannon Street, St Pancras International, Waterloo East), but also through buses and the Tube, which connects London Bridge to North, East, South, West and Central London. Among popular attractions, the most important is The Shard, which is the tallest building in Western Europe and offers a unique aerial view of London. Terrifying attractions are also available, for those so-inclined: the Old Operating Theatre, Museum and Herb Garret and the London Bridge Experience. There are plenty of restaurants and bars in London Bridge, but one thing you must try is food sampling in Borough Market. Traditional British food can be enjoyed at Tanner & Co or Roast, while dining with a view can be experienced at Gaucho or Le Pont De la Tour. South Kensington can be reached by bus or Tube, and the South Kensington Tube station is served by the District line, the Circle line and the Piccadilly line. This area is excellent for lovers of culture – it features some of London’s most important museums, including the Science Museum, optimal for families; the Victoria and Albert Museum, focused on art and design; and the Natural History Museum. Concerts can be attended at the Royal Albert Hall. Major green space representatives can also be visited here, like Hyde Park and Kensington Gardens, where you can admire Kensington Palace, home of the royals. Kensington’s Royal Parks also feature attractions such as the Diana, Princess of Wales Memorial Playground, the Serpentine lake, the Serpentine Gallery and the Albert Memorial. 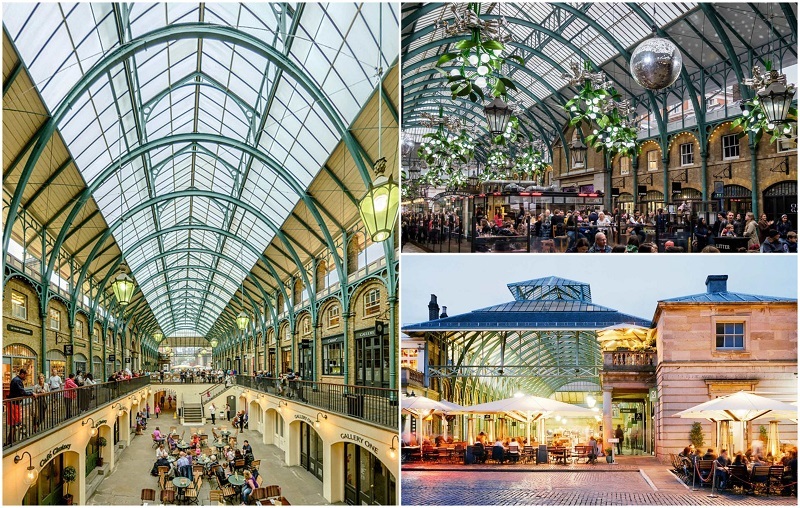 Covent Garden is a well-known hot spot for entertainment, from the impromptu street performers in the Covent Garden Piazza, to the exquisite performances of the Royal Ballet and the Royal Opera at the Royal Opera House. The London Transport Museum is worth visiting with the family, to admire the public transportation systems put on display here, as well as the range of toys, home wares, books and models available at the gift shop. Shopping is an ideal pastime when you find yourself in Covent Garden, both in the Covent Garden Piazza and at Seven Dials. The dining experiences here will not disappoint, either – try PipsDish, if you’re feeling adventurous and confident in someone else’s culinary tastes, The Ivy, if you’re star struck or Holborn Dining Room for traditional British cuisine. Regent’s Canal is a more tranquil area, a river stretching approximately 14km in the outskirts of London. One of the activities you must try is a trip along the canal in a narrowboat as it passes a number of major attractions. Both the London Waterbus and Jason’s Trip make a journey from this “Little Venice” to Camden Lock Market. 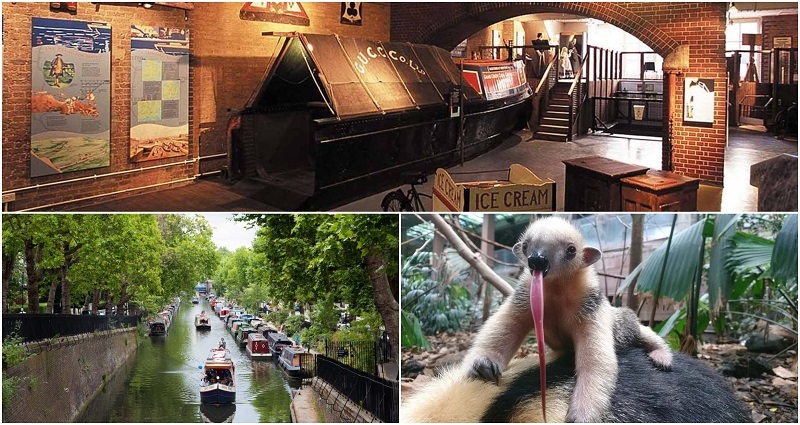 Along the same vein, you can visit the London Canal Museum to learn all about narrowboats. Within Regent’s Park, there are other attractions including the Open Air Theatre and the impressive ZSL London Zoo, which is especially entertaining for children. Have a walk around Primrose Hill for a spot of shopping along celebrities, or a drink at one of the many pubs and restaurants in the area, including Lemonia, a well-known restaurant specializing in Greek cuisine. These are easily the most convenient places in London to stay if you want to get to popular attractions quickly. You could even stay a few nights in each region to get the most out of your London holiday. If you have other areas in London in mind, let us know where you think the best places are to stay in the comments below. All the main attractions are in the list! I used to live near Hyde park and my favourite route for walk was from Marble Arch down to Oxford street, then through beautiful Regent Street with all the shops I adore, then from Piccadilly Circus to Trafalgar Square, and down to Parliament Street to the main London must-see – Big Ben, then Westminster Bridge through picturesque Themes River and finally to London Eye! Making little stops for pictures or coffee in nice cafe – the best day you can have in London!